Now that we're into the second half of my 12 Nails Of Christmas, I'm definitely going in a more traditionally Christmas-y direction, but still trying to keep everything my personal style. 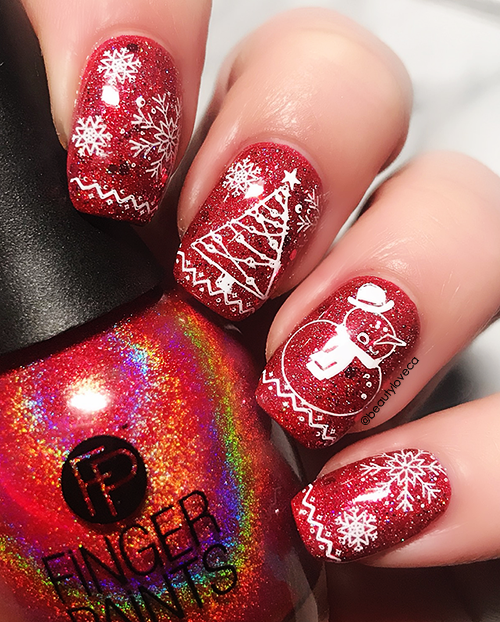 I really, really wanted to do a mani with a bold red base and I really wanted to do a cute snowman mani... so I sort of merged the two and did this simple nail art look featuring basic white stamping. I chose this white stamping because I really felt like it would pop, but also maintain a delicacy that would work beautifully with such a bold base - at least for my tastes. I really wanted to get a rich base for this - think those gorgeous indies that pack so much dimension and interest - and I just didn't have a red in my collection that would get it done so I decided to sandwich glitter with a (sort of) holo base and then add a holo top coat. I started with a coat of Finger Paints Red Rocket, which has one of those bottles that looks like an amazing linear holo but doesn't have much holo pay off on the nails, and followed with a coat of Sinful Colors Decadent and then repeated the process with another coat of each. Once those layers were dry, I went in with a coat of China Glaze Fairy Dust, which really added a solid holo punch to the look. For the stamping, I knew that I wanted images with delicate lines that would almost feel like a line drawing. 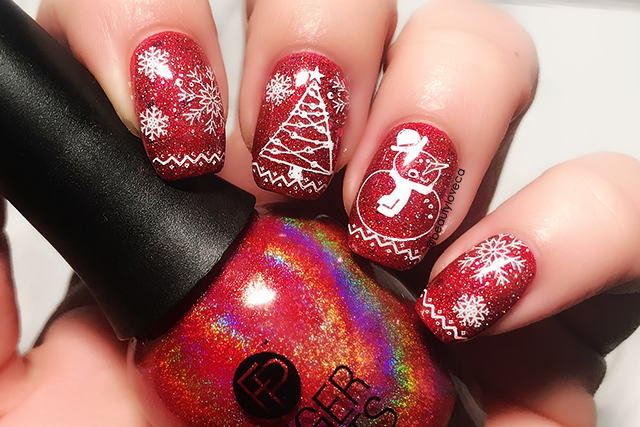 I decided to use the BornPrettyStore White Stamping Polish for all of the images because the pairing of red and white for Christmas is classic and would keep it simple but really show up. I started by adding the sort of chevron line from the BornPrettyStore Christmas L001 Stamping Plate at the tip of each nail to really tie the look together. Next, for my first and pinkie fingers, I went to the BornPrettyStore Christmas S003 Stamping Plate and used two different snowflake images to fill but not overwhelm the nail. For my ring finger, I really, really wanted to use this snowman image from the L001 plate, so I transferred it and then added the bowler hat for good measure. For my middle finger, I wasn't initially quite sure what to do, but I remembered that there was this great Christmas tree image from the XY-Merry Christmas 05 Stamping Plate, so I reached for that and then added two more snowflakes to that nail to give that fullness to that image as well. I finished with a generous coat of Essence The Gel Polish Top Coat (one of my favorites that doesn't smear the stamping) and a quick swipe of cuticle oil and voila! I think nail art can get pretty daunting, particularly when you're first starting out, but I think this particular mani is evidence that you can get something really impactful with just simple pairings and pretty colours. One thing that I've personally found for my own taste is that when I pair bright colours with really busy patterns, it ends up feeling like too much for me, but this pairing has that delicacy that keeps it from being overwhelming. 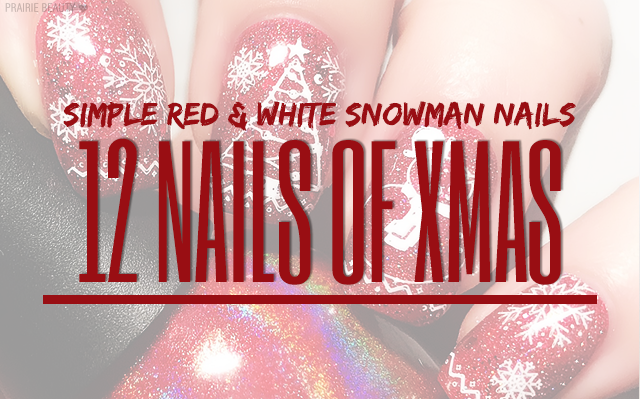 Remember, friends, I've got four more mani's to go in my 12 Nails Of Christmas leading up until Christmas Eve, so be sure to check back here on the blog every couple of days until the 24th to see all of my Christmas nail art. Also, click here to see the rest of my 12 Nails manis!